Prof. Kamuntu and team see off the captured crocodileto Murchison falls. File photo. Uganda is set commemorate global wildlife Day aimed at raising awareness about the plight of wildlife and galvanizing support for the many global and national actions to save iconic animal species. March 3rd, is World Wildlife Day proclaimed on December 20, 2013, during 68th session of the UN General Assembly aimed at celebrating and raise awareness of the world’ s wild animals and plants. According to Minister of Tourism, Wildlife and Antiquities Prof. Ephraim Kamuntu, the celebrations will be premised under the theme ‘Creating Harmony between Wildlife and People’ adding that the main functions will be held on March 3, 2019 at the Boma Gardens in Arua District. Being the best tourist destination in Africa and the 4th in world according to international rankings, Uganda is privileged with wildlife beauty and there has been effort to gazette game reserve national parks and cultural sites. 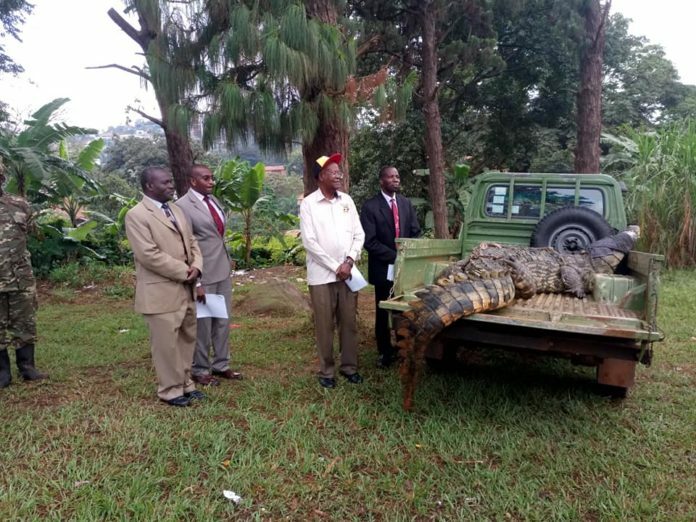 The minister said they have organized various events leading up to the wildlife day celebrations, including Uganda wild life marathon on 24th February 2019. “For Uganda wildlife is a heritage of the country. Every time you poach, you create an imbalance in the concentration of wildlife, animals and plants that live in the wild have an intrinsic value and contributes to the ecological, genetic, social, economic, scientific, educational, cultural, recreational and aesthetic aspects of human well-being and sustainable development,” he said. According to UN, World Wildlife Day is an opportunity to celebrate the many beautiful and varied forms of wild fauna and flora and to raise awareness of the multitude of benefits that conservation provides to people. the Day reminds us of the urgent need to step up the fight against wildlife crime and human induced reduction of species, which have wide-ranging economic, environmental and social impacts.